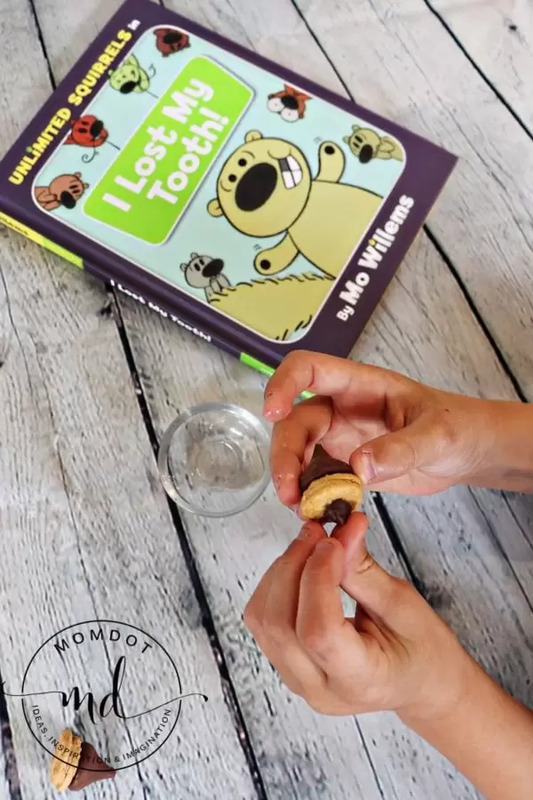 Home » Recipes » Unlimited Squirrels: I Lost My Tooth! Review (Plus a Yummy Acorn Treat)! 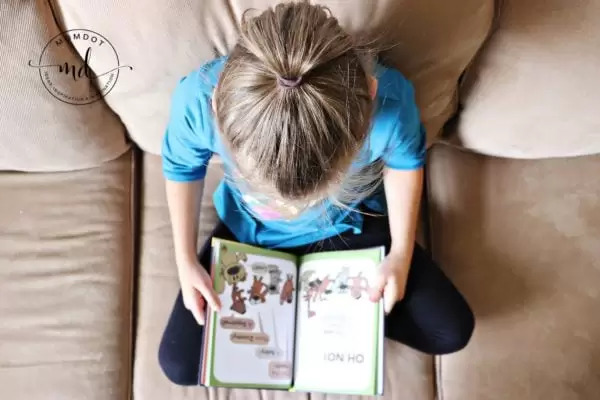 This post is sponsored by Disney Book Group, but opinions expressed are my own! I only work with and share brands I know and love. My 7-year-old daughter, Taybree, is the fourth child in our family. She has spent literally years watching her brother and sisters go through the incredible adventure of losing teeth. Consequently, she’s had a very hard time waiting for her turn with this amazing phenomenon. She was convinced at age 4 that she had her first loose tooth. Turns out that tooth was “loose” for about two years before we were actually able to pull it out! Fast forward to today and she’s working on her third wiggly tooth. Every day she shows me the progress of how much it moves and how close she’s getting to losing it. The truth is I love seeing her excitement for this. It brings a smile to my face every time. It was almost serendipitous that we got a new book to start reading right around the time that little baby tooth decided to start working its way out. 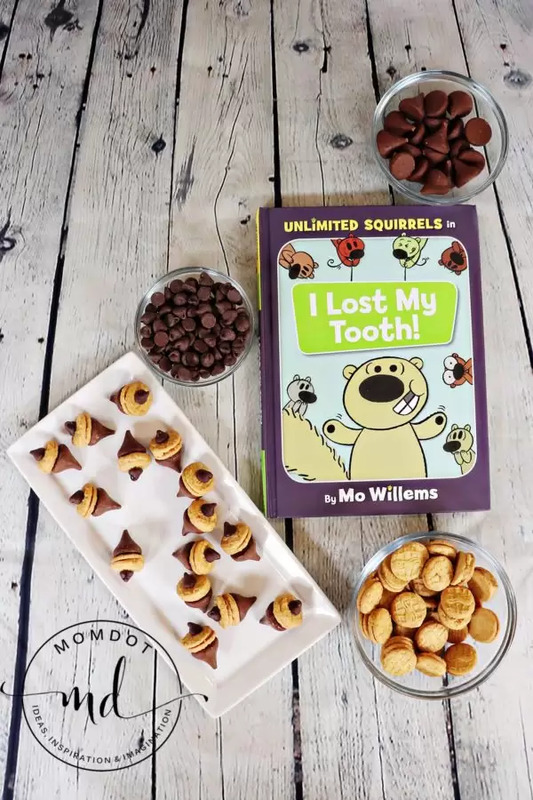 The book is called Unlimited Squirrels: I Lost My Tooth!, and it’s the first in an all-new series by author Mo Willems, who created the Pigeon series (which we adore). Taybree was very excited to sit down and start reading this book with me. We hadn’t even turned the first page before she was already enthralled. She loved seeing the multitude of squirrel characters each with their own look and personality. We went through everyone’s name trying to memorize who they were and wondering how they would be involved in the story. Unlimited Squirrels: I Lost My Tooth! was fun from the get-go. The squirrels “talk” to the reader which is really engaging for the child. I LOVED the “emote-acorns” on the pages of the story. The small acorn faces helped show Taybree when the squirrels were having big feelings. Those big feelings included funny, happy, determined, surprised, and a host more. It was great having her notice the little icons throughout the pages which reinforced what was happening in the story. We loved that we could read this book together. Taybree is in that beginning-reader stage, so while I read a majority to her she had no problem taking a turn with a page here and there. She enjoyed sounding out words and adding in her interpretive voices for the different squirrels. It cracked us both up. 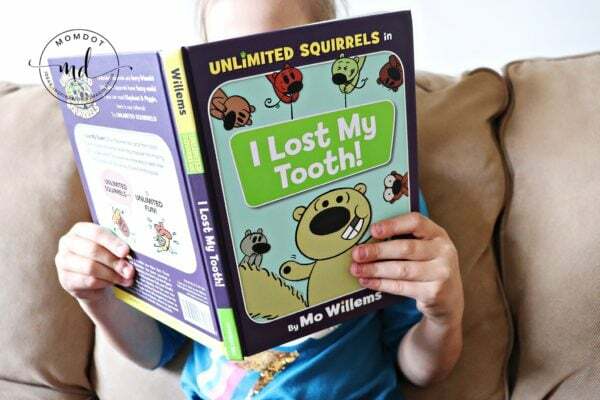 The story itself is pretty funny with Zoom Squirrel losing his first tooth. Hilarity ensues when the other squirrels learn it’s a baby tooth that is lost and there are a few misunderstandings about what that really means. It was perfect for Taybree who is in the process of losing her baby teeth. She got a kick out of relating to Zoom Squirrel and laughing at the confusion of the other squirrels as they worry and try to help Zoom but don’t get things quite right. It made us smile all the way through. And bonus: there are jokes in the book, a quick quiz, as well as fun facts about teeth. Taybree had no idea she was actually (insert conspiratorial whisper) learning as we read. We laughed together over the perfectly corny jokes. And we now know an extra thing or two about teeth! 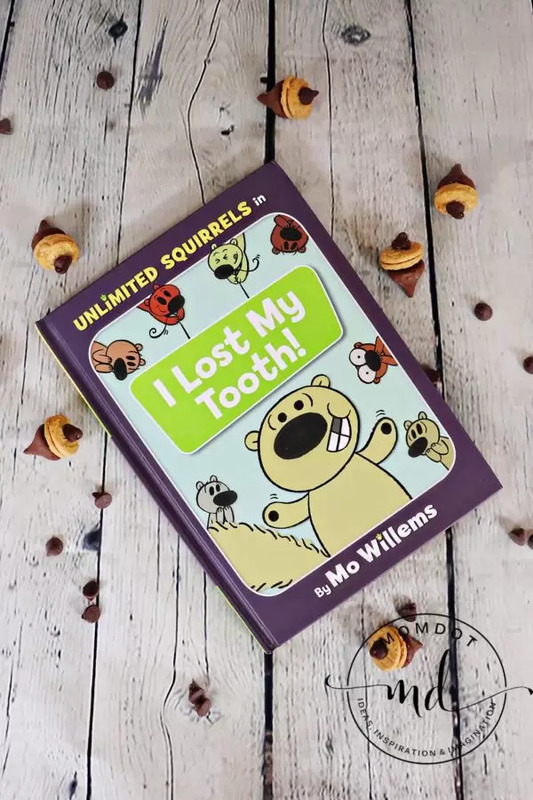 Overall Unlimited Squirrels: I Lost My Tooth! gets two thumbs up from Taybree and me. We loved the story, the characters, the extras and spending time together. You are going to want to try this book out. You can easily grab a copy here. We cannot wait to get our hands on the next one in the series! After we were finished reading I knew it was the perfect time to throw together a quick craft. I’ve been itching to do it now that the leaves are changing and fall is coming. We gathered just a few items (most of which were things I already keep in my pantry) and we were on our way to making the perfect treat for ourselves and any squirrels that might have come our way. First, gather your ingredients. I already had everything on hand other than the Nutter Butter Bites. And after making these treats I’ll be keeping those stocked in my house from now on! Second, unwrap all of those sweet little Hershey’s Kisses. Of course, you may need to watch out for little hands that want to sneak a taste or two instead of saving them for the treat. Third, pour a minute amount of Karo Syrup into a small bowl or even a lid. Next, apply a tiny dab of Karo Syrup to the Hershey’s Kiss. Helpful hint: While you could just dip the Hershey’s Kiss into the Karo Syrup we found that it put too much syrup onto the Kiss which then made it more difficult to attach to the Nutter Butter Bite. As a result, it dripped and squished and took longer to dry and stay attached. For this reason, I think it worked much better to dip a finger into the syrup and then apply just a little amount onto the Kiss. 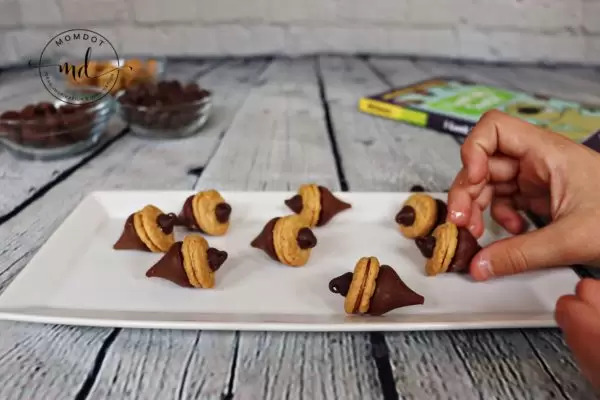 As a side note, there are probably other foods that could act as the glue between your Hershey’s Kiss and Nutter Butter Bites but I really liked using the Karo Syrup. I knew using plain peanut butter wouldn’t be ideal because it would never completely dry or harden so the acorn would fall apart. We considered chocolate icing but questioned if that would go well with the other flavors and textures in the acorn. In contrast, the syrup was clear, stuck well, and it seemed to not even be there when we tasted our acorns, leaving the delectable chocolate and crunchy peanut butter rounds an absolutely perfect combination. Moving on, put your Hershey’s Kiss and Nutter Butter Bite together and hold for just a moment. Continue on with the rest of the Kisses and Nutter Butters. Then give them just a minute to dry. It doesn’t take very long! Next, repeat the process with the Karo syrup and chocolate chips. Dip your finger in the syrup, dab it on the chocolate chip, then place it on the Nutter Butter, opposite the Hershey’s Kiss. Again, give those acorns just a minute to dry and hold together. Finally, enjoy the fruits (or nuts) of your labor! Honestly, this little activity took mere minutes to complete from start to finish. In fact, Taybree and I were ready to enjoy our Perfect Peanut Butter Acorns snack almost immediately while we read Unlimited Squirrels: I Lost My Tooth! all over again! I’m certain your grandkids would love them! They’re fast, they’re fun to make, and they’re fun to eat– what kid doesn’t like a craft like that?! I hope you have a great time making them! Let me know how they turn out.